Surviving Nirvana members Dave Grohl, Krist Novoselic and Pat Smear reunited for a six-song mini-set to close out the Foo Fighters’ Cal Jam 18 festival at Glen Helen Regional Park in San Bernardino, CA on October 6. The trio were joined by Deer Tick vocalist John McAuley for three songs – "Serve The Servants", "Scentless Apprentice" and "In Bloom" – before Joan Jett stepped in to front the lineup for "Breed", "Smells Like Teen Spirit" and "All Apologies", with the latter featuring Novoselic on accordion and Brody Dalle on bass. Novoselic’s latest band, Giants In The Trees, played a set earlier in the day at the second annual event, curated by Grohl and the Foo Fighters. Both Jett and McAuley previously performed as part of a Nirvana reunion club show that took place following the band’s 2014 induction into the Rock And Roll Hall Of Fame. Grohl says he is considering releasing material from the invite-only private event at Saint Vitus, a tiny bar and music venue in the Greenpoint neighborhood of Brooklyn. “It was cathartic and everybody involved, I think, understood that they were part of something like a dream,” explained the rocker. “I remember playing and looking and seeing Carrie Brownstein in the front row in the pit singing along to every song and, you know, getting to play drums behind Joan Jett or, god, playing ‘School’ or ‘Pennyroyal Tea’ with J Mascis. 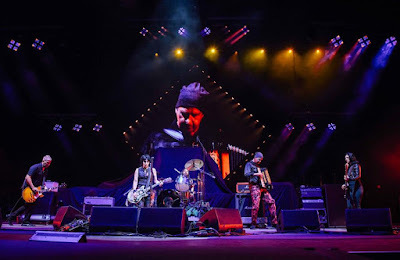 Novoselic also reunited with Grohl and Smear during a Foo Fighters show in Seattle, WA last month.